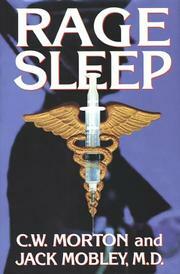 Campy hybrid of medical procedural and military thriller from Navy Lieutenant Commander Morton and her physician father. Following Morton’s first effort, Pilots Die Faster (1997), a whodunit set aboard an aircraft carrier, comes an all-over-the-map adventure that pits a good-natured Christopher “Scoot” Thorne, a handsome but emotionally thwarted anesthesiologist whose father, an Army physician, died from exposure to nerve gas during Desert Storm, against oversexed female surgeon Dr. Patterson, wicked research director Dr. Gillespie (not to be confused with Ben Casey’s mentor), and, ultimately, the deranged Lieutenant General Boothby, commander of the American forces along the Korean Demilitarized Zone. Linking the characters is an experimental anesthesia called Anaex, which Dr. Gillespie devised and which should net millions for him and his hospital, the prestigious Murphy Medical Center. While testing Anaex on humans, Thorne notices that, though patients seem to go under, and come up, faster than normal, they subsequently become prone to inexplicably violent bursts of paranoid rage. Meanwhile, the highly respected, hard- drinking, and thoroughly demented General Boothby is ordering secret acts of terrorism designed to upset the uneasy truce between North and South Korea. Back at the hospital, Dr. Patterson almost manages to seduce Thorne, but then North Korea threatens to declare war, and Thorne, an Army Reservist and JFK-assassination conspiracy fanatic, is called to active duty—all this before he can figure out whether Anaex is just one part of a diabolical international scheme linking scimitar-wielding assassins in Algeria with JFK and dark doings in Southeast Asia. Despite clunky prose, choppy cross-cut plotting, and some ludicrously detailed descriptions of anatomical gore, Morton and Mobley make the tedious craft of anesthesiology fascinating while maintaining a breathless pace to the last sighing embrace. Robin Cook meets Tom Clancy at General Hospital.